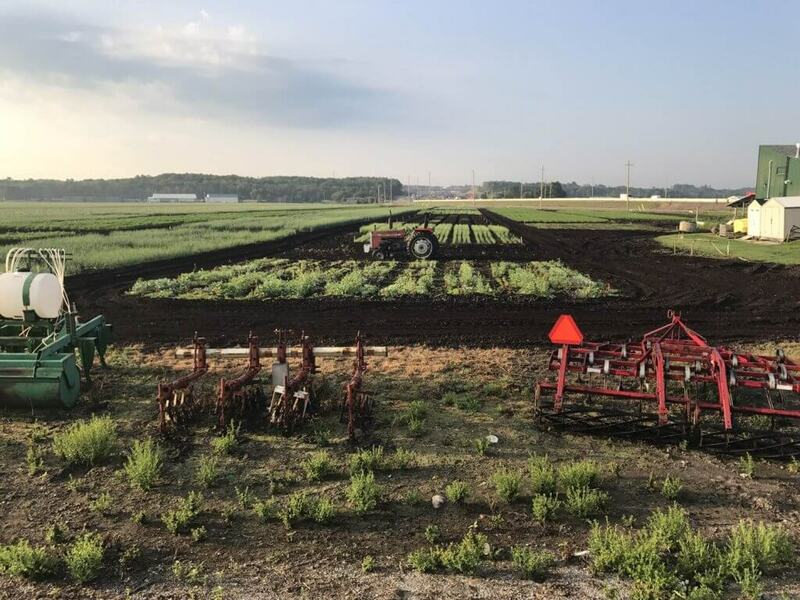 This research was performed with Dennis Van Dyk (@Dennis_VanDyk), vegetable specialist with the Ontario Ministry of Agriculture, Food and Rural Affairs. 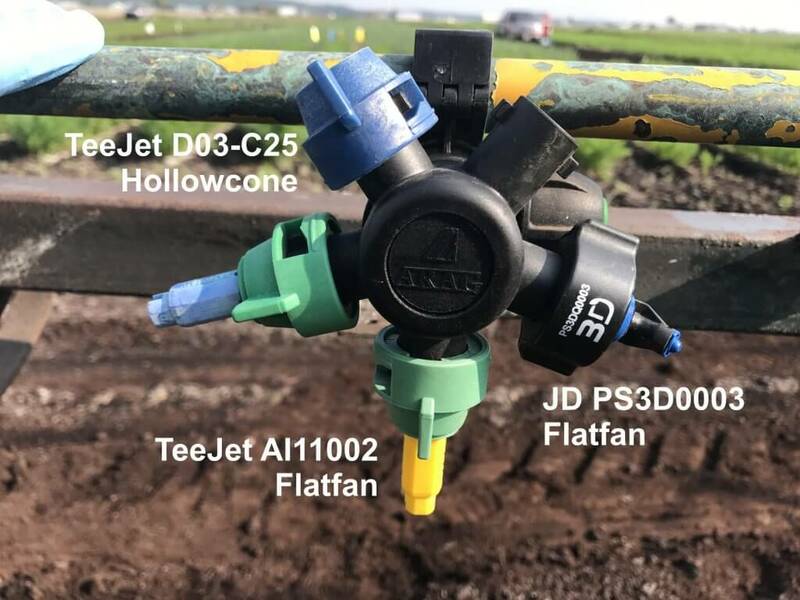 Prior to 2017, Syngenta introduced the UK to the Defy 3D nozzle, which is a 100° flat fan, designed to run alternating 38° forward or backward along the boom. 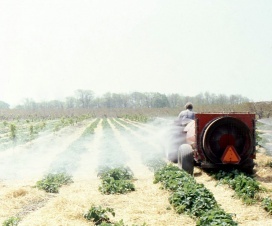 They prescribed a boom height of 50 to 75 cm, 30-40 psi, and travel speeds of 10 to 14 km/h in cereals and vegetables. 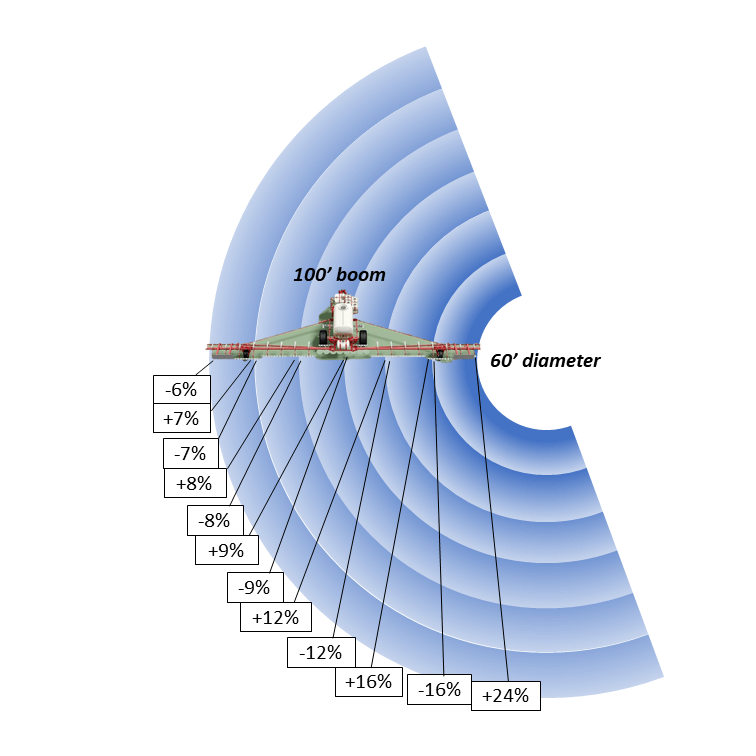 Compared to a conventional flat fan, they claimed that the angle and Medium-Coarse droplets promise less drift and improved coverage. 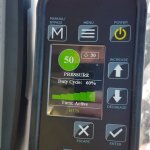 In 2017, Hypro and John Deere began distributing the Defy 3D in North America. Our goal was to explore coverage from the 3D in vegetable crops. 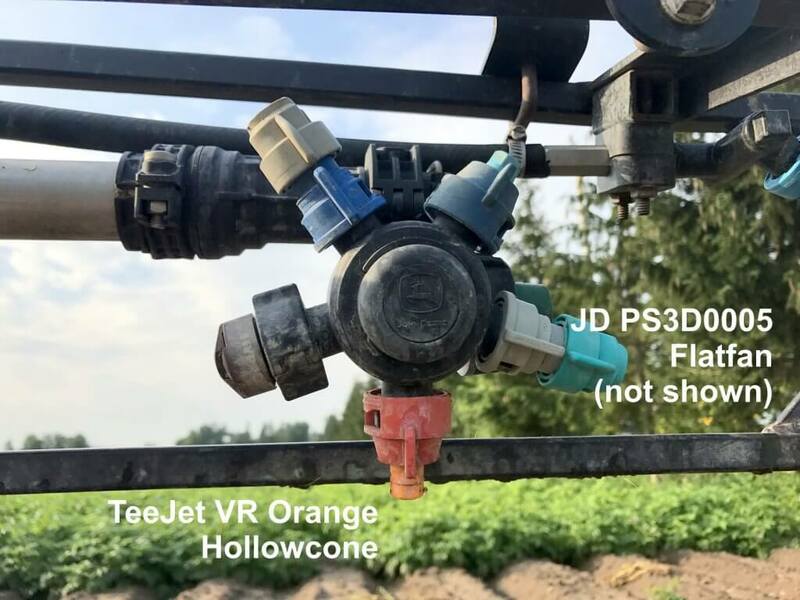 We compared the nozzle’s performance to common grower practices in onion, potato and carrot in the Holland Marsh area of Ontario. 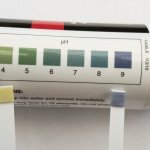 We used a technique called fluorimetry. 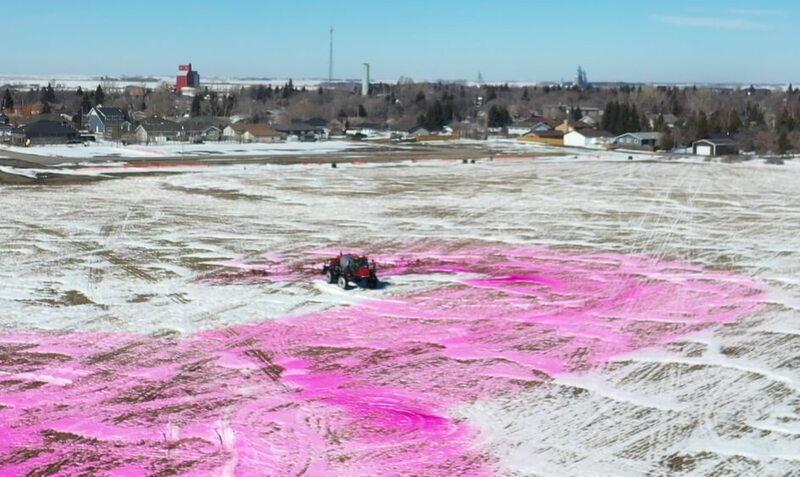 A fluorescent dye (Rhodamine WT) was sprayed at 2 mL / L from a calibrated sprayer based on protocols generously provided by Dr. Tom Wolf (@nozzle_guy). Tissue samples from the top, middle and bottom of the canopy were collected from random plants. 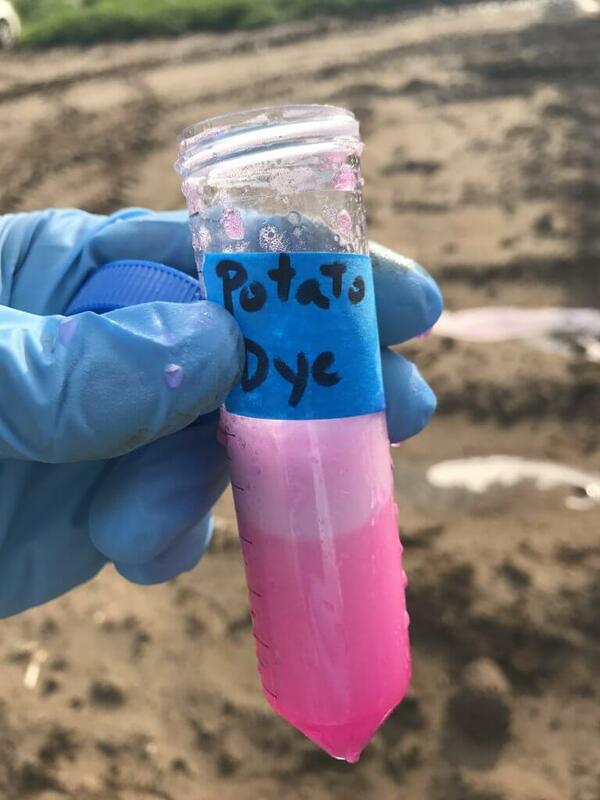 The samples were rinsed with a volume of dH2O and this rinsate was then tested to determine how much dye was recovered. 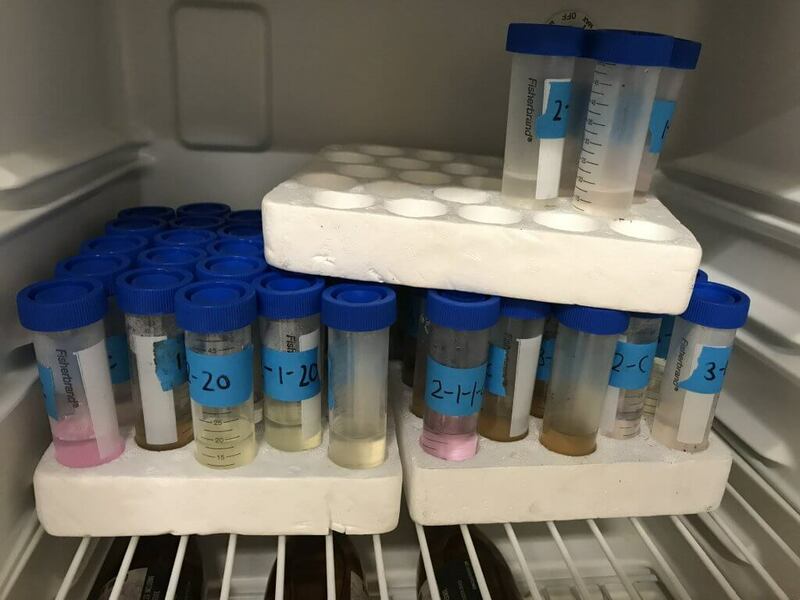 The tissues collected were dried and weighed to normalize the samples to µL of dye per gram dry weight to allow for comparison. 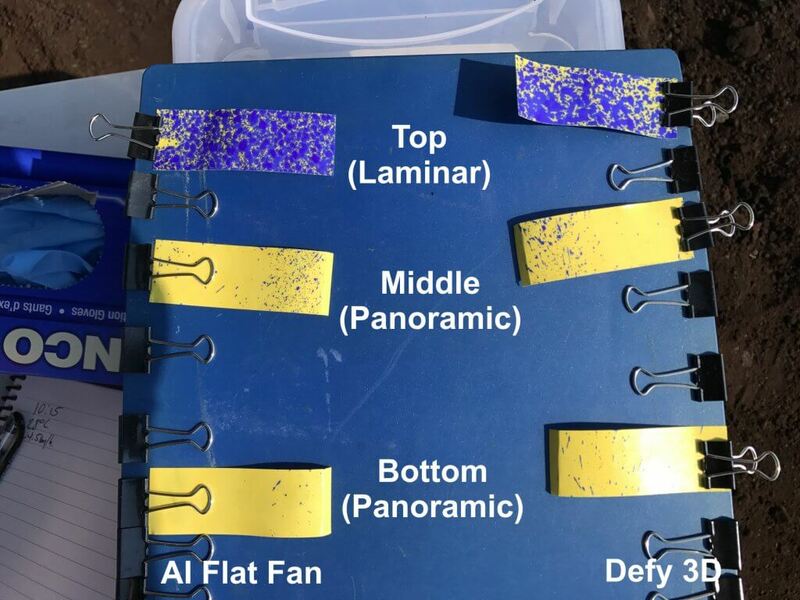 In addition, we used water-sensitive paper as a check in key locations in the canopy to provide laminar and panoramic coverage. 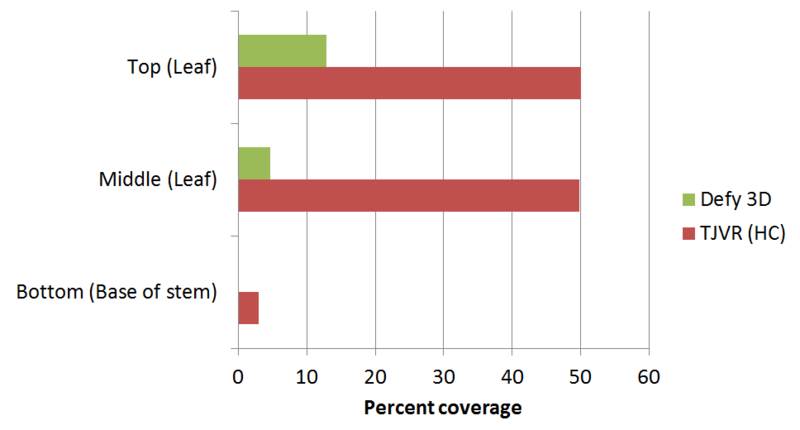 Papers were digitized and coverage determined as a percentage of the surface covered. 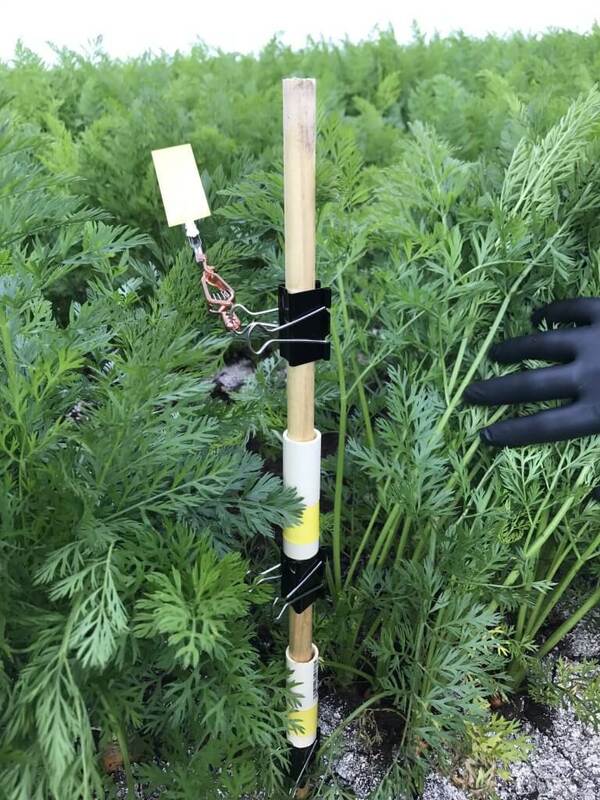 In carrot and onion, we compared a hollowcone, an air-induction flatfan, and alternating 03 3D’s at 500 L/ha (~40 cm boom height, ~3 km/h travel speed, ~27ºC, 3-9 km/h crosswind, ~65% RH). 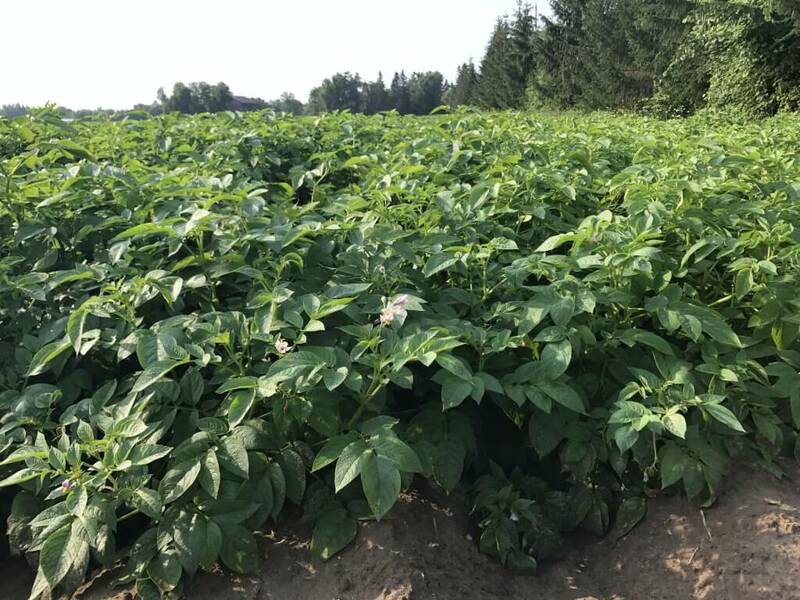 In potato we compared the alternating 05 3D’s to a hollowcone at 200 L/ha (~55 cm boom height, ~10.5 km/h travel speed, ~22ºC, 6-8 km/h crosswind, ~65% RH). 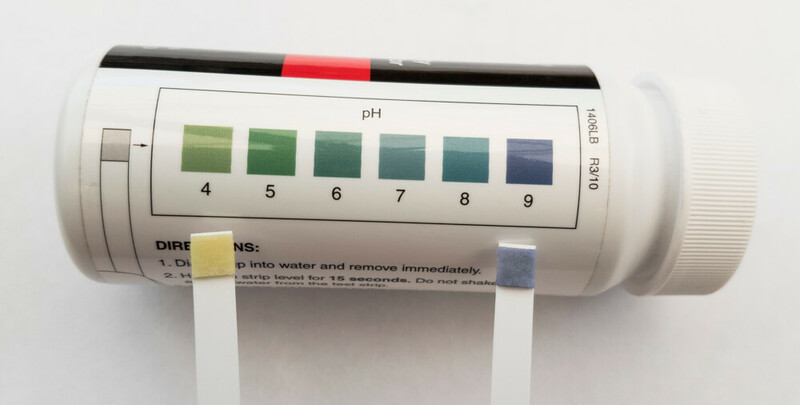 Water-sensitive papers were originally intended as a coverage check, and not as a source of analysis, but their use revealed interesting information. 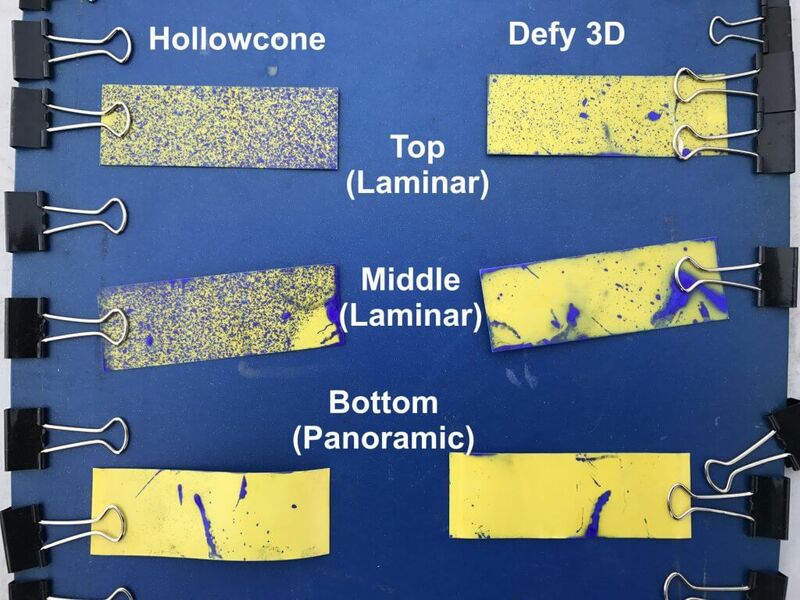 The following images are the papers recovered a single pass in each crop. 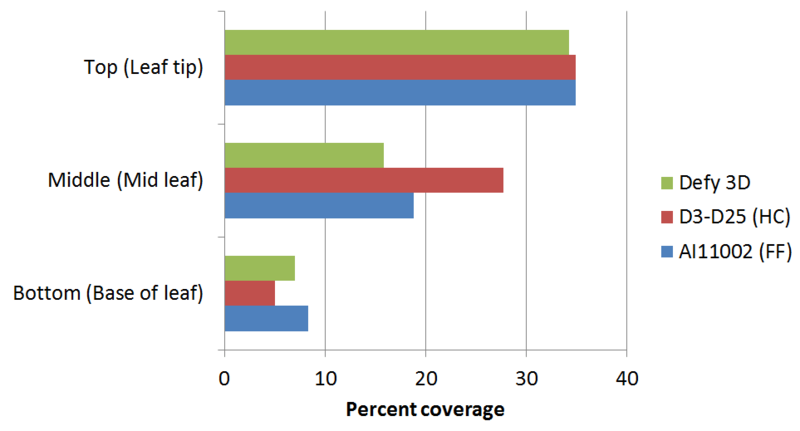 The following table represents the percent coverage of these paper targets. Papers were digitized using a WordCard Pro business card scanner and analysis made using DepositScan software. This table is small, but you can zoom in for a quick comparison. 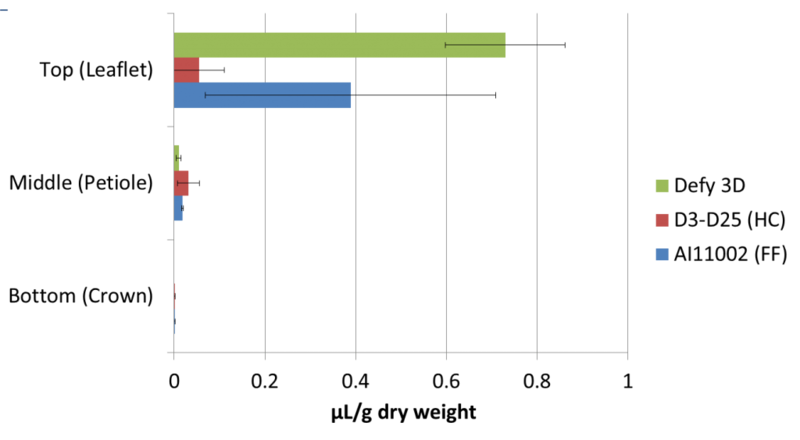 The following three histograms show the same data graphically for carrot, onion and potato, respectively. 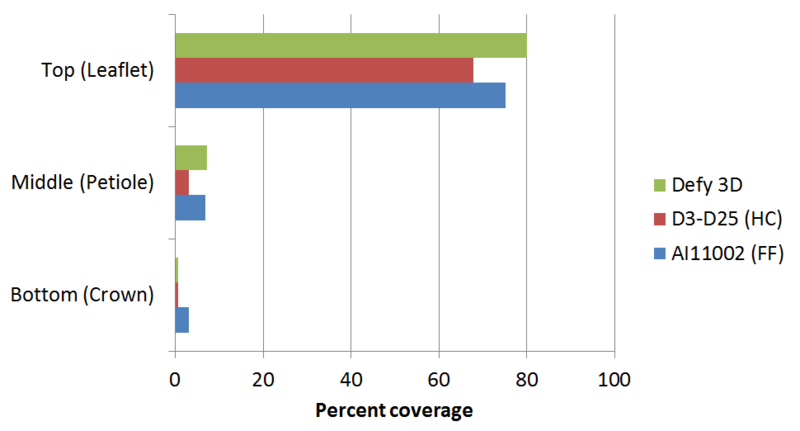 Remember, this only represents a single pass, so don’t draw any conclusions about coverage yet. 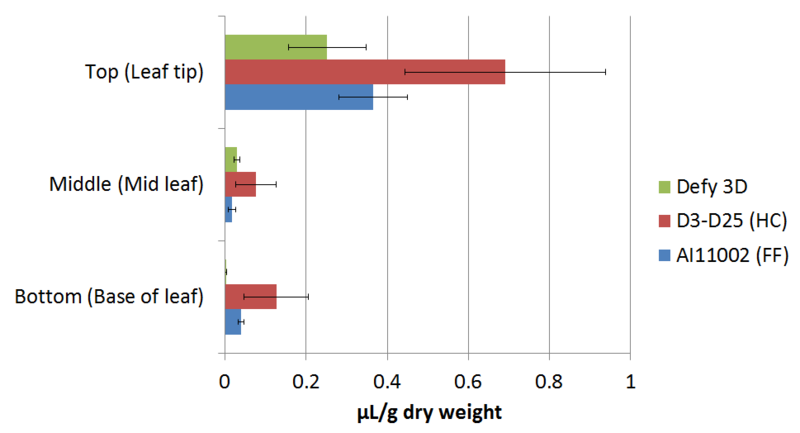 It was interesting to note differences in coverage observed on the papers versus the results of the fluorimetric analysis. 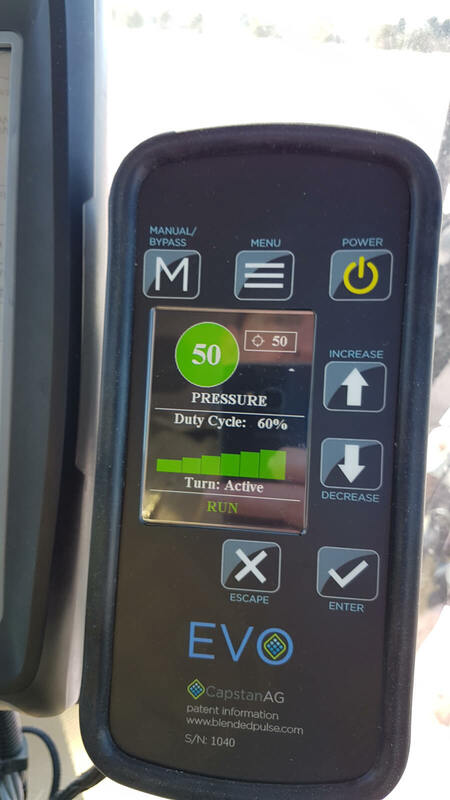 It was anticipated that while water-sensitive paper serves for rough approximation of deposition, fluorimetry would be far more accurate. 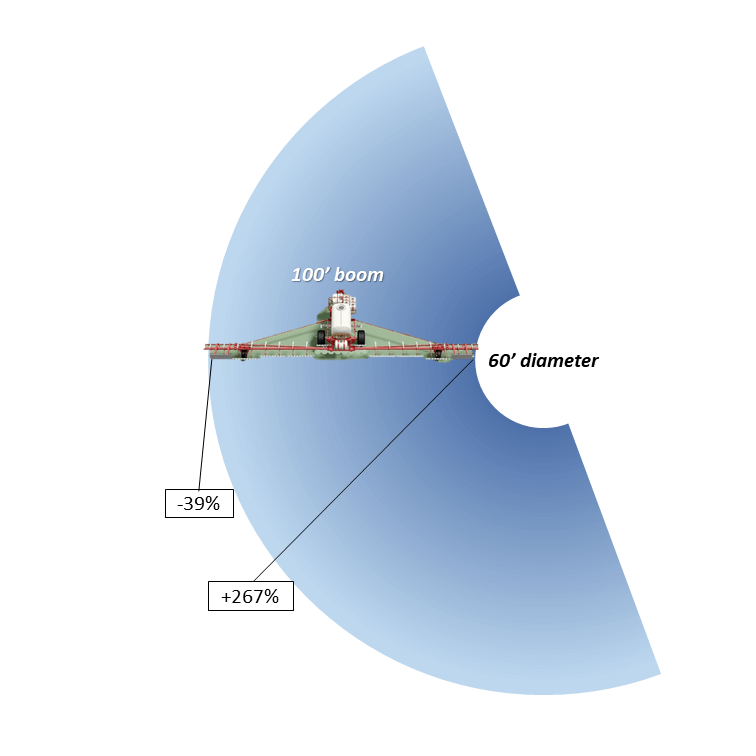 This is because of the droplet spread on the paper, and the evaporation and concentration of a spray droplet en route to the target. Again, here is a small table, and again, the next three histograms show the same data graphically for carrot, onion and potato, respectively. 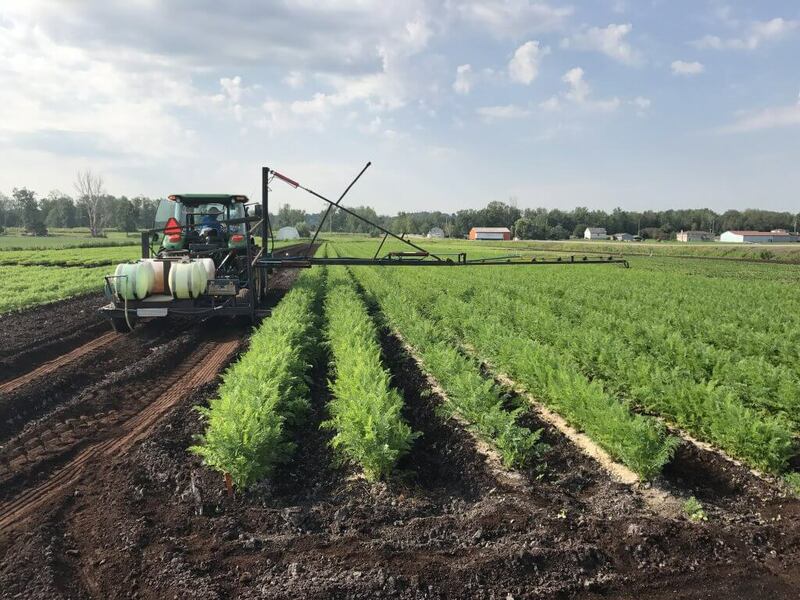 In carrot, the 3D deposited more spray at the top of the canopy. 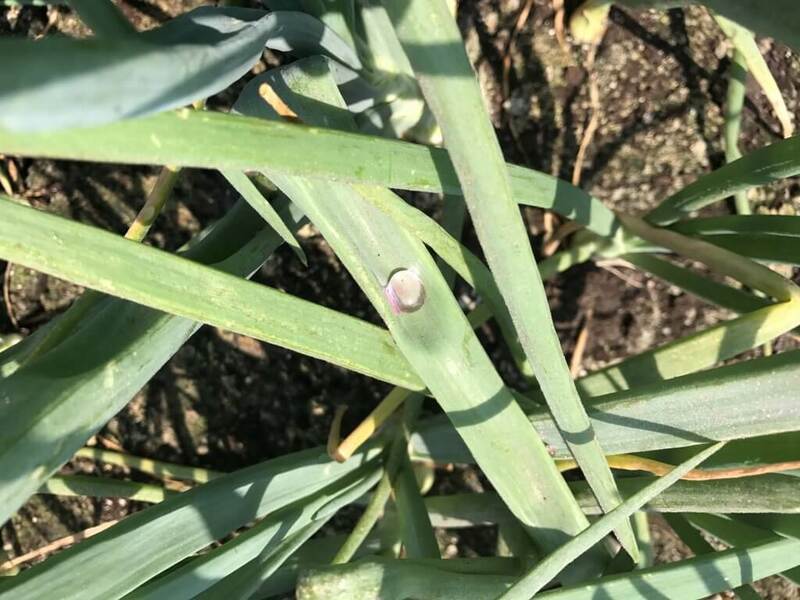 In onion, the hollowcone spray had a higher average deposit, and penetrated more deeply into the canopy. 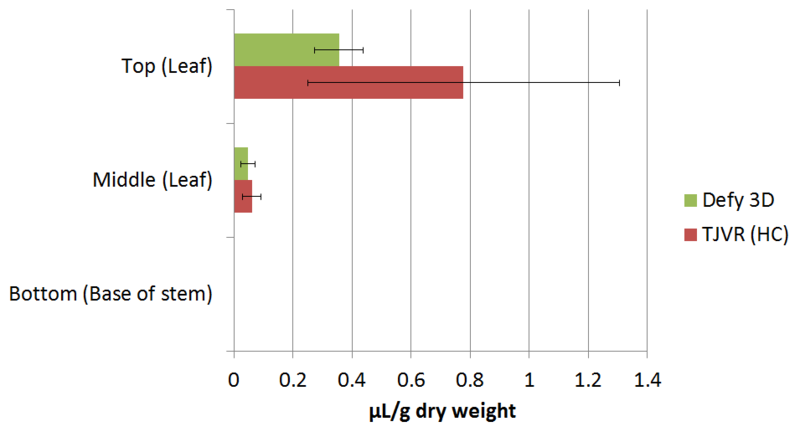 In potato, the hollowcone deposited more spray at the top, with little or no difference mid-canopy. Each nozzle performed well at the top of the canopy, which is quite easy to hit. Certainly they exceeded any threshold for pest control. 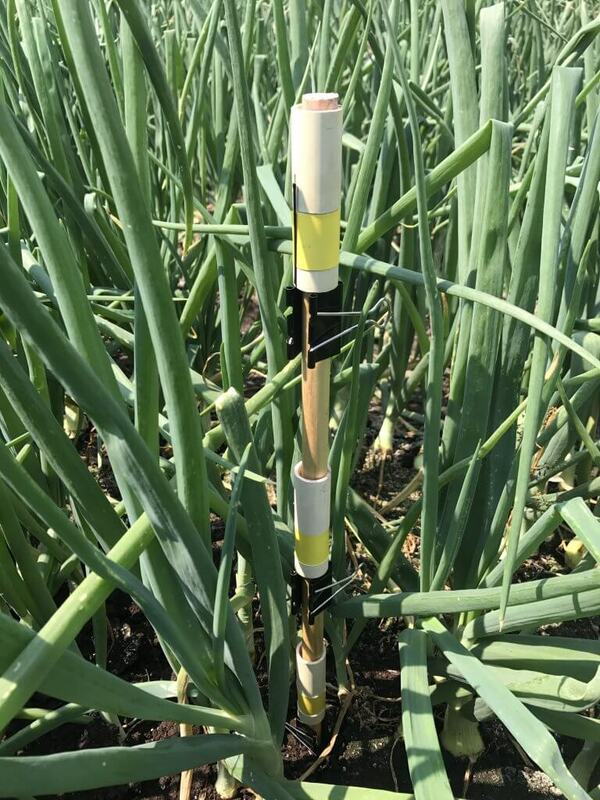 With the possible exception of hollowcone in onion, nozzle choice had only minor impact on mid-bottom canopy coverage. 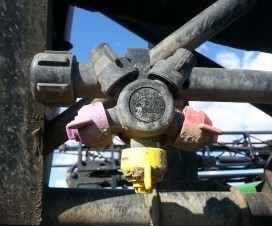 And so, if coverage is not a factor for distinguishing between these nozzles, we should consider drift potential. 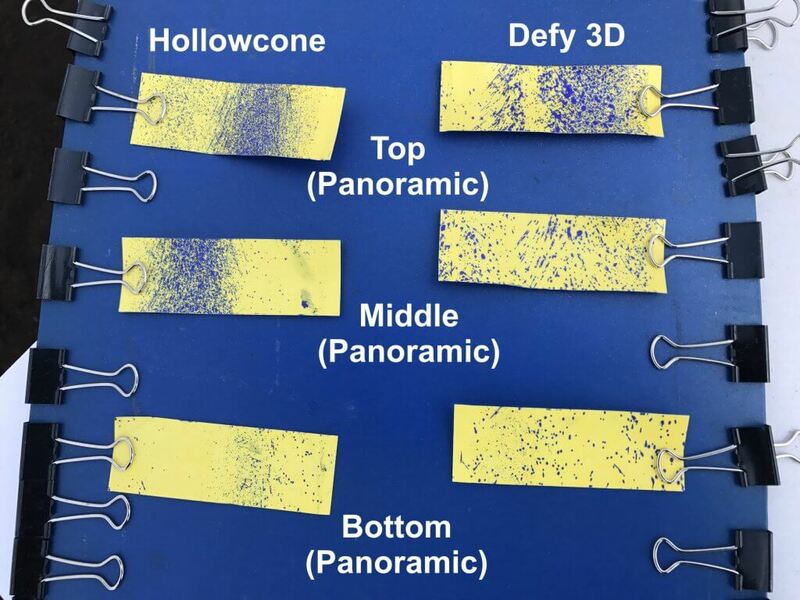 Due to the comparably smaller droplet spray quality, the hollowcone is far more prone to off target movement. This leads us to select the AI flat fan or the 3D as the more drift-conscious alternatives. 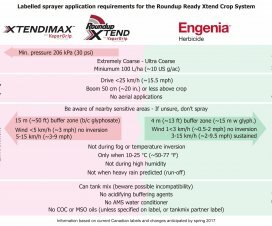 Future analysis would benefit from a larger sample size to reduce variability, and the inclusion of an air-assist boom to better direct spray into the canopy. 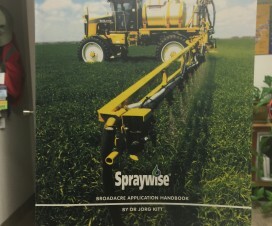 Applitech Canada (Hypro / SHURflo) is gratefully acknowledged for the 3D nozzles. Thanks to Kevin D Vander Kooi (U of G Muck Crops Station) and Paul Lynch (Producer). 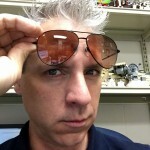 Assistance from Will Short, Brittany Lacasse and Laura Riches is gratefully acknowledged. 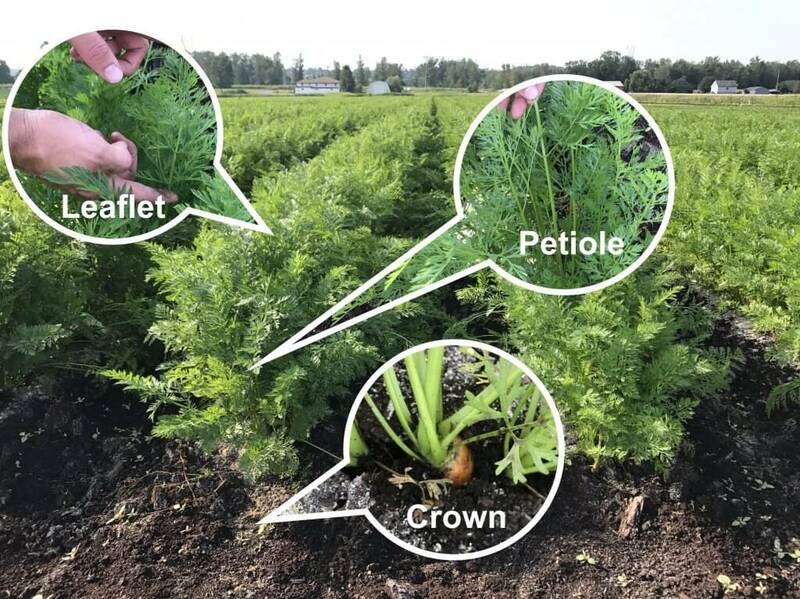 Research made possible through funding from Horticultural Crops Ontario.